Rose was true to her word -- she never did let go. Ten years later, “Titanic” is still the top grossing film of all time. $1.8 billion overall. The only one who came close -- “The Lord of the Rings: The Return of the King” -- was $700 million shy. $700 million. That’s the entire international gross of the “Transformers” movie which, you may recall, did pretty well this year. Remember when the tabloids jumped all over the budget? $200 million! No big-name stars! No sequel potential! Who let James Cameron chase gold-plated windmills? What wanton hubris! Ha ha ha. Of course now the Monday morning quarterbacks could give you 100 reasons why “Titanic” sailed off with the prize and has yet to be beaten by any number of stars, special effects, hobbits, wookies, pirates or wizards. But I don’t care. I just know how much of a total arse I made of myself the first time I saw it, the five subsequent screenings, and every time I watch my DVD and dance to the Irish music during the “real party” in steerage. Yes, it’s my fault it’s the No. 1 movie of all time. Me and several million 13-year-olds. 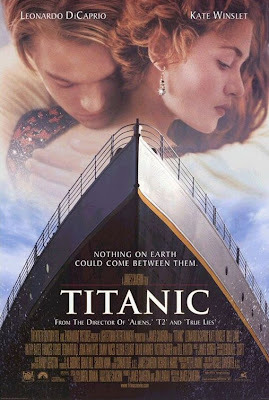 I first saw “Titanic” on Dec. 21, 1997 -- two days after it opened. I know because I transcribed the painfully earnest experience in my diary. The theater in my then-hometown of Lowell, Mass., was sold out. I was 21 but didn’t have any friends then -- or now -- willing to see “Titanic.” So I went with my mom and her friend. It pains me to admit this. I only do so because I know I am far from alone in my hindsight of shame. After that fateful night I watched “Titanic” two more times in this country. I worked at a movie theater in Burlington, Mass., so when not seeing movies in Lowell I saw them for free 20 minutes away. But I did manage to waste unrecorded amounts of money on stories, photos, gossip -- anything on Leo and Kate or the real Titanic. Sometimes even a story on Billy Zane would do, if nothing else was around. Since these were the halcyon days before mainstream Internet, scouring newspapers and magazines was my best bet. In February of 1998 I started my five month study abroad in Perth, Western Australia. I stayed in something of a Smurf village with about 30 cottages, each with eight students inside. It was “Real World: Australia” in my house with three Americans, three Australians, a Korean and -- depending on the month -- a Malaysian girl or a Chinese professor and his assistant. Australia is about three months behind the United States in getting movies. So when I arrived Down Under, my Aussie and Korean roommates and some neighbors from Japan and Malaysia hadn’t seen “Titanic” yet but were dying to. So I saw it three more times. 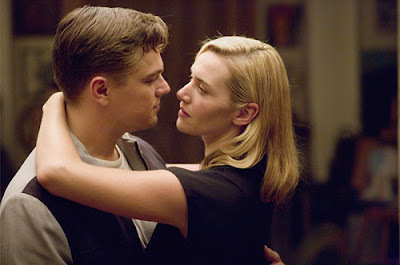 My Korean roommate fell as hard as I did and swore her boyfriend back home looked just like a Korean Leonardo DiCaprio. Half-way through my study in Australia I had to fly to Florida for my brother’s wedding. It takes a full 24 hours just to fly from Perth to Tampa, not counting layovers. I had four days in Florida. I made sure one of them included a trip to the Titanic museum in St. Petersburg. I bought the Titanic mug I am drinking tea from as I write this. The last time I saw “Titanic” on the big screen was outdoors -- also the last time I saw a drive-in movie. Three Australian friends and I drove to a place in the middle of nowhere, set up a picnic blanket and watched a “Titanic”/“Full Monty” double feature. It was perfect. Ten years later, I don’t have a “Titanic” special edition DVD. I don’t plan to buy the new commemorative one. I have a cheapie I bought with some measure of chagrin a couple of years ago and have only watched in pieces. It pales on the small screen. I find myself criticizing things I had long given a knee-jerk defense. I have no patience for Bill Paxton -- though I love him -- and any of his modern story. I roll my eyes at Billy Zane. I wince anew at the Picasso reference and the spitting. I squint with dispassion at Rose’s suicide attempt and wonder if maybe Kate Winslet did look a little heavy in that scene. A couple of years ago I read an article in Psychology Today about how people connect more strongly over things they dislike than things they like. So the “Titanic” backlash movement must be a band of brothers by now. The Web site “Why People Hate Titanic” quotes Kenneth Turan of the Los Angeles Times: "... the flip side of ‘Titanic’s’ ability to draw hordes of viewers into theaters is... (that) in its unintentional underlining of how narrow an audience net most movies cast over the American public, ‘Titanic’ is not an example of Hollywood's success, it's an emblem of its failure." Snob. Whatever. At least he watched it. 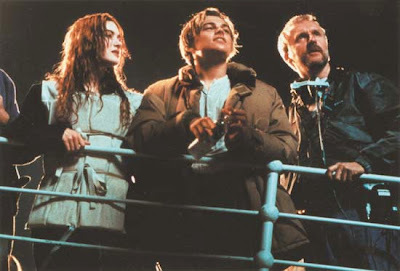 I feel a mix of sadness and frustration for my friends who pride themselves in never having seen “Titanic.” Go ahead and hate it for the schlock it certainly is (The script! Celine Dion! Leo’s hair! 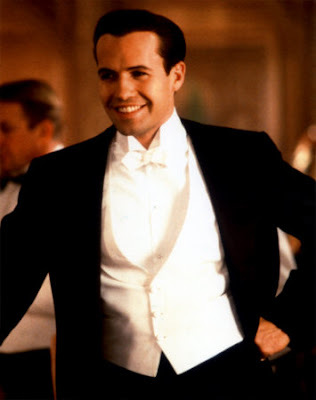 Billy Zane!) but see it first so you can load the right ammunition. No amount of time or cynicism can diminish my love for “Titanic” or pride in having been a part of something larger than myself. Just the fact that I bonded with people from around the world over love for this movie warms the cockles of my heart. Cheesy as it is, that’s a memory I’ll never let go. Gina Carbone used to write film reviews for the Curtin University newspaper in Perth. She can be reached at gcarbone@seacoastonline.com.